How the Oregon shooting was covered Fox News, CNN, and MSNBC before the networks knew a thing about it. 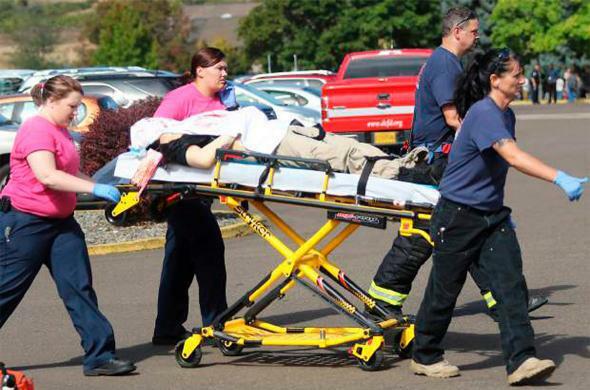 First responders transport an injured person following a shooting incident at Umpqua Community College in Roseburg, Oregon, on Oct. 1, 2015. 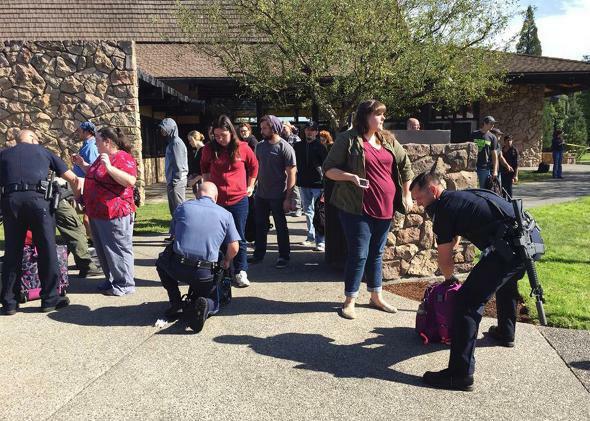 By now, we all know that there’s been another school shooting, this time at Umpqua Community College in southern Oregon. But for what seemed like a very long time this afternoon, that was all we knew. Further details were hard to come by, which posed a challenge to the many journalists who were tasked with reporting on what had—and hadn’t—happened. If you, like me, were toggling between the three main cable news networks this afternoon as they struggled to report the story in a virtual information void, you saw three different and distinct journalistic strategies at work: circumspection, observation, and pontification. Here’s what I glimpsed, and here’s where I saw it. Shepard Smith anchors Fox News’ coverage of the story this afternoon, and he and Fox correspondent Trace Gallagher are doing their best to refrain from spreading rumors and falsehoods in the absence of any verified information. “We have confirmed the shooter is no longer an active threat. We don’t know if he’s the only shooter,” says Gallagher, who proceeds to note that, in the absence of reliable casualty data from the police, it would be irresponsible to speculate on the number of victims. This is good work from Fox here. Over to CNN, where anchor Brooke Baldwin has much more to work with than Fox did; her producers are doing good, quick work finding guests to call and offer some information on the shooting and the region. When I tune in, a guest is giving Baldwin some demographic information on the UCC student body: more than half of the student population is female; the average student age is 38. (“Huh,” remarks Baldwin.) “That’s what we’re learning so far: That it’s not your traditional institution, it caters to people who are a little bit older, the majority of them part time,” reports CNN, and this, too, is good work; if you can’t say anything meaningful about the incident itself, you might as well offer some context on the setting in which it occurred. “It happened inside a classroom,” says Shoufler, who proceeds to offer a few more factoids before briefly going silent. “Ray, are you OK?” asks Baldwin. She seems to think he’s overcome with grief, which seems a bit presumptuous. Soon, Williams goes to MSNBC host Thomas Roberts, who proceeds to read some tweets presumably issued by people who were on campus when the shooting occurred. “Holy God, this is the scariest thing I’ve ever seen,” one tweet reads. More social-media recitations follow. “Let me scroll down,” Roberts says. “What I heard is that it happened in the science building,” Kittelman says. “I don’t know what a ‘rioter’ is,” says Smith. 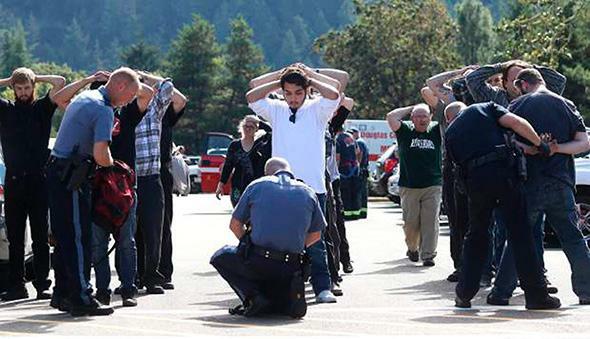 Police officers inspect bags as students and staff are evacuated from campus following a shooting incident at Umpqua Community College in Roseburg, Oregon October 1, 2015. Back to CNN, where national correspondent Deborah Feyerick and Brooke Baldwin are fruitlessly dissecting Ray Shoufler’s decision to say that the shooter had been neutralized, as opposed to killed or captured or something more precise. “The use of the word neutralized is so odd. Not the sort of word you use,” says Feyerick. This line of inquiry is neither fruitful nor interesting, and it is mercifully abandoned as Baldwin brings in CNN military analyst Rick Francona, who offers some interesting context on Oregon state gun laws. The Umpqua Community College campus was reportedy a gun-free zone, a designation that “tells licensed gun owners that you are not allowed to carry your weapon in this facility,” Francona says. “Conversely… if you’re going to perpetrate some act, you know that most people are not going to be armed.” This is the sort of bigger-picture analysis that’s actually helpful, insofar as it directly relates to and helps clarify aspects of the situation on the ground in Oregon. Unfortunately, Baldwin soon drops this line of conversation and returns to her earlier semantic discussion: “The shooter has been neutralized. Does this mean that the shooter is alive or dead? We don’t know that yet.” CNN reports that they are hearing that the attack began in the school’s science building, and soon spread to various classrooms. Baldwin’s producers have found her another guest. “I’m being told here in my ear, we’re just going with this: Marilyn Kittelman is on the line here,” she says. That’s my cue to switch over to MSNBC, where in the absence of any good information about what has happened, Brian Williams and his guests continue to speculate on what we will probably learn about this incident in the near future. “I’m afraid you’re correct that this’ll kick off a whole new wave of coverage about gun laws, about gun laws and mental health in this country,” Williams tells a guest, “and that in the coming days we’ll hear a whole lot more about this troubled person.” Just minutes earlier, CNN was also talking about gun laws. But CNN was doing so in a reportorial context. Williams seems to be talking about them just to hear himself talk.